Egypt Braces Amid Reports Of Parliament Being Dissolved : The Two-Way Parliament had passed a law barring former Mubarak aides from seeking office. Now the nation's highest court has rejected that. And it has taken aim at the parliament. Protests are expected. 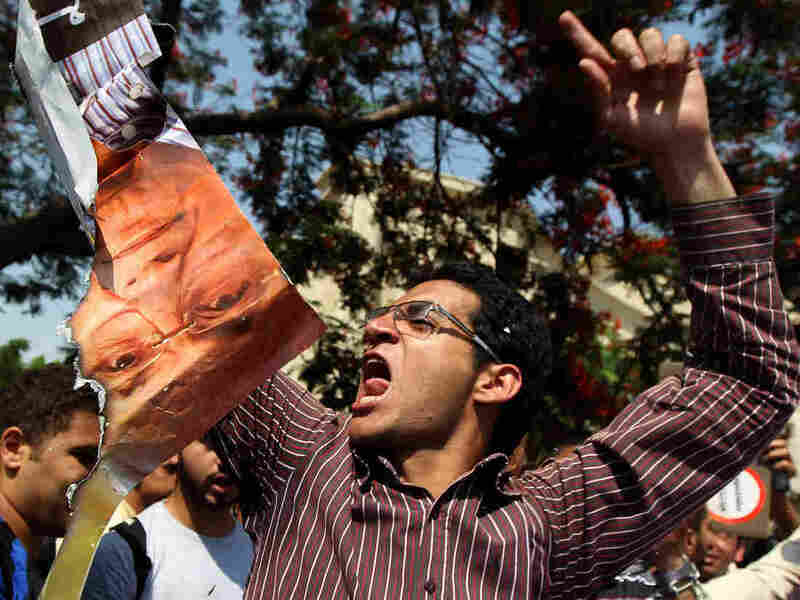 An Egyptian protester chants slogans as he holds a ripped poster of presidential candidate Ahmed Shafiq outside the Supreme Constitutional Court in Cairo today. Rulings by Egypt's highest court to dissolve the country's parliament and keep a former aide to Hosni Mubarak on the presidential runoff ballot have thrown that country's already shaky democracy into chaos. Much is still unclear about what was happening. "Egypt's high constitutional court ruled that members of parliament were not elected legally, but did not elaborate. Egyptian State TV says the ruling military council is taking over legislative power, a move that is drawing a sharp reaction from the Islamists who dominate parliament and youth groups who led the revolution that ousted Mubarak." There were other reports, however, that indicate only about one-third of the parliament's lower house is being dissolved. "The explanation was carried by Egypt's official news agency and confirmed to The Associated Press by one of the court's judges, Maher Sami Youssef. The ruling means that new elections for the entire parliament will have to be held." We'll keep watching as the story develops. Update at 12:25 p.m. ET. The Chain Of Events. After conflicting reports in Egyptian media over whether a third, or the entire, parliament was to be dismissed, Al Jazeera's Rawya Rageh obtained a copy of the court decision, which explicitly states that the entire parliament is dismissed because of 'constitutional violations.' "
"The high court, packed with sympathizers of the ousted president, appears to be engaged in a frontal legal assault on the Muslim Brotherhood, the once outlawed organization whose members swept to power in Parliament the spring and whose candidate was the front-runner for the presidency as well," The New York Times writes. "The ruling — which critics said amounted to a backdoor coup — means that whoever emerges as the winner of the runoff scheduled for this weekend will take power without the check of a sitting parliament and could even exercise some influence over the election of a future parliament." Update at 10:45 a.m. ET. "That's It For Egypt's So-Called Transition." Foreign Policy's Marc Lynch writes that "today's moves by the Constitutional Court on behalf of the ruling Supreme Council of the Armed Forces (SCAF) seem difficult to overcome and likely to push Egypt onto a dangerous new path. With Egypt looking ahead to no parliament, no constitution, and a deeply divisive new president, it's fair to say the experiment in military-led transition has come to its disappointing end. ... The SCAF's power grab in the final days looks more like panic than the execution of a carefully prepared master scheme. It likely reflected a combination of fear of rising Islamist power, self-preservation, and growing confidence in its ability to control street protests." Egypt's highest court ruled today that Ahmed Shafiq, a former prime minister in Hosni Mubarak's regime, may remain in that country's presidential race despite a law passed by the Egyptian parliament that bars senior Mubarak aides from seeking office. NPR's Soraya Sarhaddi Nelson tells our Newscast Desk that the court also issued a ruling that effectively dissolves one-third of Egypt's parliament. As The Associated Press writes, Shafiq and Islamist Mohammed Morsi "finished as top vote-getters from the first round of the [presidential] election last month" and were headed for a runoff vote set for this Saturday and Sunday. But "the Supreme Constitutional Court was meeting to consider the validity of a law passed in April by the Islamist-led parliament that denied political rights to anyone who held a senior post in government or ruling party in the last decade of Mubarak's rule," Reuters says. It was the so-called political isolation law, as al-Jazeera puts it. Now, there are fears of violence in the streets. Security forces are reproted to be surrounding the court, as protesters gather. Critics say the court is beholden to the former president. The Guardian writes that "Egypt's political transition has been thrown into chaos" by the ruling about parliament. And just what is going to happen to parliament is very unclear at this hour. From Cairo, Soraya tells our Newscast Desk that Egyptian State TV is saying the lower house of parliament will be completely dissolved. That's what Reuters is reporting may happen as well: "A constitutional court ruling on Thursday means that the whole of the lower house of Egypt's parliament will be dissolved and a new election will have to be held, the court's head Farouk Soltan told Reuters by telephone after the ruling was issued." 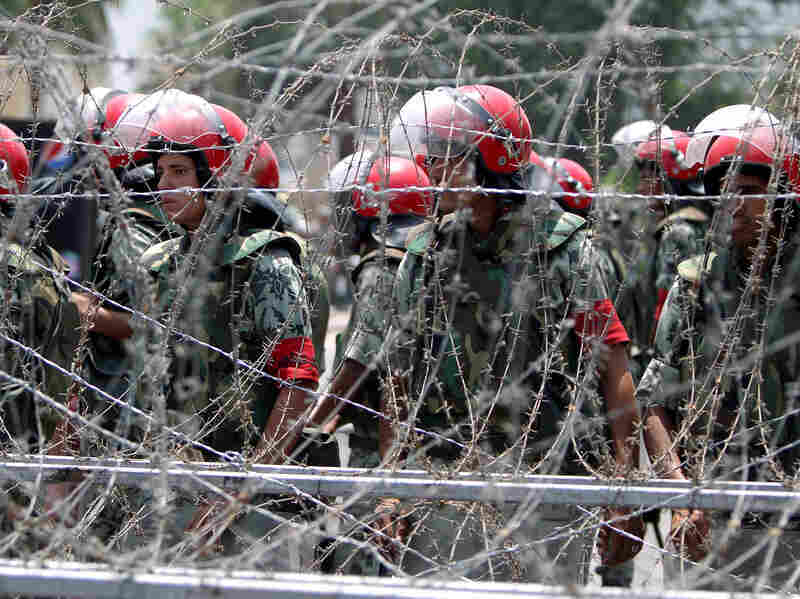 Reuters also says that, "outside the court by the Nile, protesters threw rocks at hundreds of troops and state security conscripts who were guarding the building, which was sealed off by rolls of barbed wire. Some of the security forces began unloading dozens of boxes of tear gas canisters."